WENDELL, N.C.- Odor and toxic gas problems at swine production farms are an old and persistent problem that effect surrounding areas. Some argue that there are health hazards, pollution problems and quality of life issues in the affected areas. The basic problem for the farmer is that they do not have a good method to add dissolved oxygen to the wastewater in the lagoons to eliminate the odor and toxic gases. A good way to eliminate lagoon odor is to aerate the lagoon with our unique system and maintain the amount of dissolved oxygen in the waste lagoons at 1 to 2 ppm. This will give the beneficial bacteria enough oxygen to live and digest the waste in lieu of just going septic which is the cause of the odor and gas formation. Using pump aerators that spray the waste water into the air are not very efficient and incur high energy and maintenance costs This technology only provides aeration within the spray circle about 18" deep. The deeper areas get very little dissolved oxygen. Toxic gases can layer into the solids and be released upon agitation. A normal waste lagoon system may require 5 to 10 spray aerators which can require a total 250 to 300 HP to operate the pumps, generally; the farmers cannot afford the energy costs to run these machines. In addition, maintenance of these units is expensive and time consuming. This method has no capacity to circulate the aerated water for enhanced bacterial digestion. Some experts suggest that the industry install anaerobic lagoons to capture and use the methane gas the lagoons create. This is very expensive and requires maintenance to ensure the integrity of the lagoon seals. In addition, there may be a safety hazard by storing 3 or 4,000 cubic feet of explosive gas on the farm. The process of reusing this gas for fuel for heating is problematic as operators may not be eager to deal with the safety issues that arise in handling a highly explosive gas. 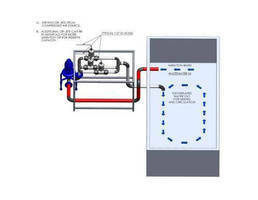 Most municipal wastewater plants use bottom mounted aerators/diffusers to provide adequate oxygen for bacterial respiration and good digestion of the organic waste. This solution is not practical for farmers as diffusers would quickly foul and become inefficient due to the high solids waste being treated. Fortrans Inc offers a solution for providing cost effective aeration in animal waste lagoons by using the patented Dif-jet air injector that does not foul during operation in high solids water. The Dif-Jet systems are located out of the water so any maintenance is easy. Each Dif-Jet air injector in the system manifold can add from 1 to 2 pounds of dissolved oxygen per hour per horsepower to high solids wastewater depending on blower capacity/cfm of air delivered to the aeration manifold and the size of the air injector. Single-Port PoE Midspan/Injector uses shielded RJ-45 jacks. Metered Dose Injector helps control Japanese Knotweed.